For Navrathri Some sweets, snacks, sundal or fruits can be offered as 'neivedhyam'.To know about how navrathri festival celebrated read here. 5. Then addFruits, fried rava stir it once and let it cook till water is absorbed and rava leaves the walls of Pan. 6. Add ghee and essences, cardamom powder stir it and garnish with cashew &raisins Serve hot or cold. kesari looks really yummy Jaishree. I don't why your feed is not updating in my blog. will check out. happy navratri...this fruit kesari looks awsome.. 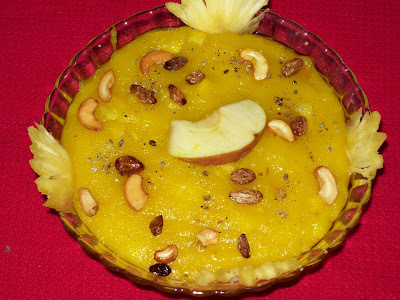 I love fruit kesari and this look yummy,mouth watering!